VANCOUVER, B.C. (Oct. 1, 2018) – Jackie Little shot 1-under 72 in Monday’s opening round of the PNGA Senior Women’s Amateur at Shaughnessy Golf and Country Club to take a four-shot lead with one round to play. In the Super Senior Amateur, Holly Horwood posted an even-par 73 to open, giving her a four-shot lead as she attempts to defend her title in this championship, having won last year when it was held at Overlake G&CC in Medina, Wash.
Little’s was the only round under par on the rain-softened course. She has twice won this championship (2008, 2009), and last year was inducted into the Pacific Northwest Golf Hall of Fame. Earlier this summer she won the BC Senior Women’s Amateur. Hanging close with Horwood in the Super Senior are past champions Beverly McGladery (2012), who is in third place, and Mary Ryan (2016) and Karen Madison (2015), who are tied for fourth. Phyllis Laschuk is in second place, four shots back of Horwood. Last year, Horwood was inducted into the Golf Hall of Fame of British Columbia. The PNGA Senior Women's Amateur is flighted by age: 50-54, 55-59, 60-64, 65-69, and 70+. The field is filled by exemptions first, and then by date of receipt of entry. 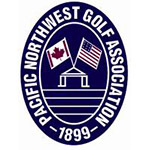 Players must be members of PNGA member clubs.